Make sure that you login regularly to keep up to date. Not a subscriber? Contact us to find out how to stay informed with the latest Foodservice Market Research. 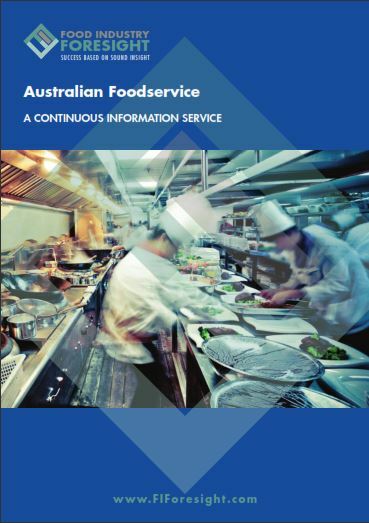 Australian Foodservice Outlet Numbers Database and Analysis Report for 2017 now available. Foodservice sector – commercial & institutional • Foodservice channel by state • Annual growth rates • Major fast food chains – number of outlets by state • Minor fast food chains – number of outlets by state • Snack food chains – number of outlets by state • Café/coffee chains – number of outlets by state • Restaurant chains – number of outlets by state. AFS - Distribution in Foodservice - mapping the major Foodservice Distributors, their structure, coverage, size and strengths. Also covering developments in Manufacturer's Brand versus Distributor's Own Label/Private Label. Available to subscribers to AFS. AFS - Foodservice Trends & Developments Report - including channel developments, characteristics and drivers in the commercial and institutional sectors. Also overall trends, developments and market conditions, supplier choices, challenges and opportunities. Available to subscribers to AFS.